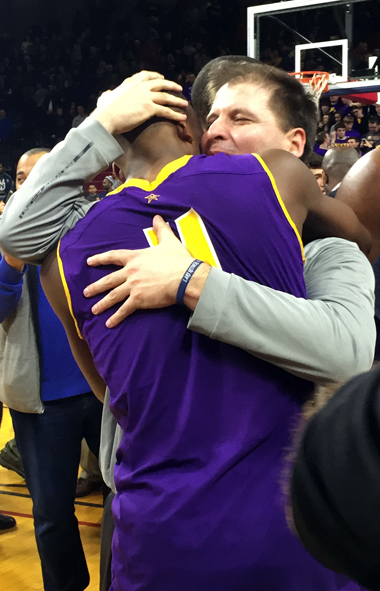 By now, mostly everyone knows that Roman Catholic defeated Neumann-Goretti, 64-59, in Monday night’s Catholic League championship at the hallowed, and jam-packed, Palestra. How the Cahillites became champs warrants a recall. Outside of a quick 4-0 deficit, the scoreboard favored Roman Catholic from the start. Leads of three became five, and then eight, and then 11, and as the halftime buzzer blared, the lead had swelled to 15. Loyal Cahillite fans, resplendent in purple and gold, were already celebrating. Indeed, if there was ever a perfect start to a basketball game, this was it. But in the mind of first-team All-Catholic junior Tony Carr, the contest wasn’t over. Far from it. 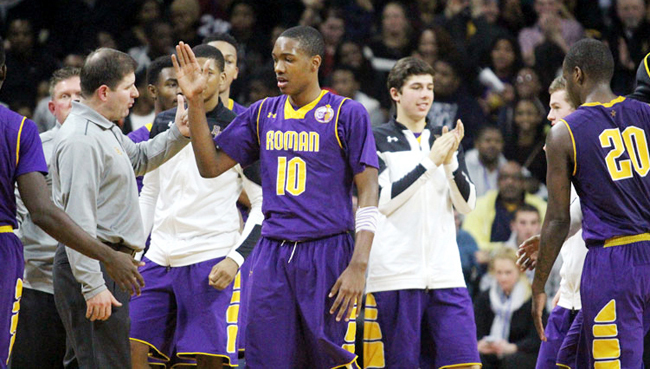 Carr was referring to Neumann-Goretti, which came into the game winners of six consecutive Catholic League titles. The Saints (23-2; both losses to Roman Catholic), who finished the regular season in first place with a 12-1 record, were trying to become the first school in league history to win a seventh straight championship. The only other team that had won six was, ironically, Roman Catholic, which dominated the CL from the 1988-89 season through 1993-94. They lost in the 1995 championship to Archbishop Carroll and then defeated Carroll the following year. Sure enough, the Saints (sophomore Quade Green 21 points; junior Zane Martin 13; senior Lamarr Kimble 11) did respond by climbing to within 50-46 after the third quarter, 54-52 with 5:33 left in the fourth, and 58-57 with 3:10 remaining in regulation. Only 13 seconds later, the Saints had a point-blank chance to tie and take the lead, but they missed the front end of a one-and-one foul shot. And 50 seconds later, they did it again. But those missed foul shots (they shot a composite 2 for 9), too many uncharacteristic turnovers and a deficiency of rebounds proved too much to prevent Roman Catholic (23-2 overall) from dethroning Neumann-Goretti and winning their first Catholic League championship since 2007. Although he had pivotal help in the form of Carr (eight points, six rebounds, four assists), senior Manny Taylor (six points, six rebounds, four assists), senior Gemil Holbrook (14 points), and sophomore D’Andre Vilmar (seven points), Bostick was, truly, a basketball “horse” – hence his longtime nickname. In addition to netting a game-high 23 points on 9 of 13 shooting, Bostick also enveloped 13 rebounds and played tenacious defense from start to finish. It seemed as though every time the Cahillites needed a key contribution, Bostick delivered. His reverse layup with 1:42 ultimately served as the winning basket because it gave Roman a 60-57 lead and ended a three-minute, 15-second offensive dry spell. After the game, Bostick was emotionally overcome. He knelt to the floor as family and friends hugged him. His tears overflowed. Roman coach Chris McNesby could hardly finish a sentence before being besieged by a steady stream of congratulatory embraces. A 1995 Roman graduate who played on two championship teams and another that lost in the league final, McNesby said Roman became a bit passive in the second half and that allowed Neumann-Goretti back in the game. Carr, one of the league’s MVP candidates, spoke glowingly of both his teammates and their foes. “It takes a lot to win a championship,” Carr said. “Sometimes you have to score 20, and sometimes you have to score 10 and do something else. Sometimes you have to rebound, and sometimes you have to do it on defense. There are a lot of ways to contribute, and you have to be unselfish with it. You can’t play for stats. On that, the defense rests.